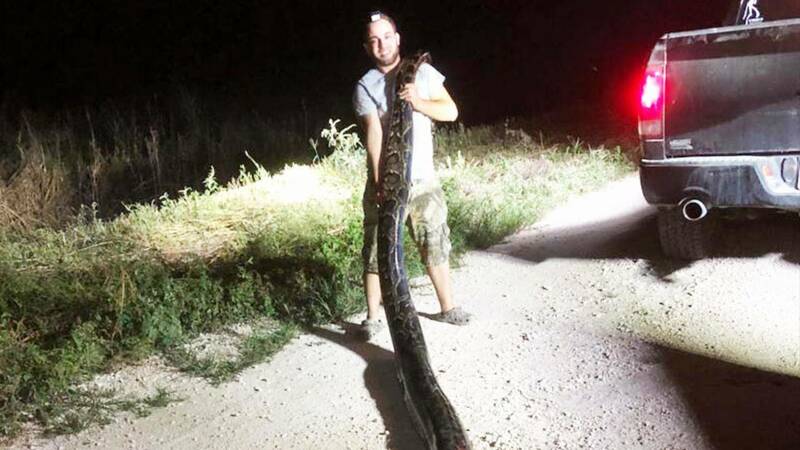 An enormous 17-and-a-half foot long Burmese python is no longer plaguing the streets of Florida, thanks to the brave snake hunter who captured it. Kyle Penniston, of Homestead, spotted the 120-pound snake in the Miami-Dade area earlier this week and made the capture on his own. The Burmese python, measuring at 17-foot-5, is believed to be the largest snake ever caught in the area. It is only one of three snakes longer than 17 feet that has been caught as a part of the Python Elimination Program, according to a statement from the South Florida Water Management District (SFWMD). The Python Elimination Program allows a team of professional python hunters to capture pythons living on SFWMD land. Pythons are an invasive species and are harmful to the local ecosystem, SFWMD said. "With the Governing Board's unwavering support, District staff and a dedicated group of hunters are working to help control this invasive species and protect native wildlife,” said the organization’s scientist and program manager, Mike Kirkland. Including this capture, Penniston has captured 235 snakes since the program’s inception and is only second to Miami native Brian Hargrove, who has captured 257. Collectively, the program has seen nearly 2,000 pythons removed from the area.